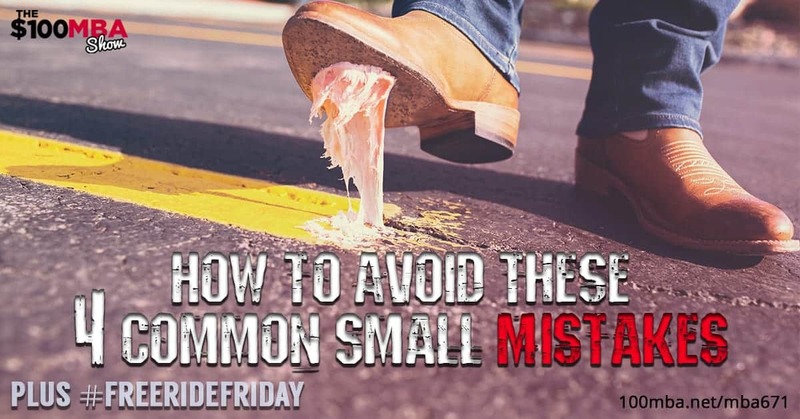 How to Avoid These 4 Common Small Mistakes Plus Free Ride Friday! MBA671 How to Avoid These 4 Common Small Mistakes Plus Free Ride Friday! Is it just me, or is it FREE RIDE FRIDAY!!!? Today, we discuss 4 very common little mistakes that entrepreneurs make. They’re little enough to not be obvious, but big enough to have a negative impact on your business! Listen in, and find out how to avoid them- or how to stop if you’re making them already! Click play! « Previous Post MBA670 What is Product Hunt? & How to Get On It Next Post » MBA672 Q&A Weekends: I love your emails. Where do you find all those great GIF’s?